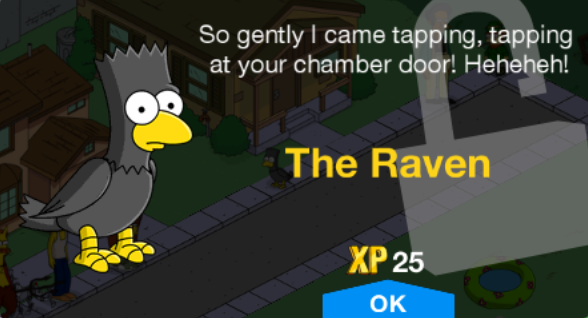 The Raven is the title character and antagonist in "The Raven", a poem by Edgar Allan Poe. The raven visits the poem's narrator, who is grieving for his deceased wife, Lenore. The narrator asks the raven to tell its name, but the bird only says "Nevermore" and refuses to say anything else no matter how many times (or what questions) the narrator asks him. The narrator interprets the bird's stubbornness as mockery, flies into a rage, and eventually goes insane from the combined effects of his grief for Lenore and the torment of the raven's visit. 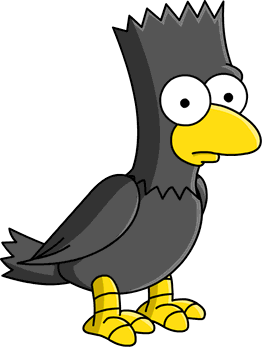 When Homer heard Lisa reading "The Raven", he imagined himself as the narrator and Bart as the raven. He was scared by the story and later thought he saw the raven outside the bedroom window. The Raven appears in a diorama about Jebediah Springfield in the Springfield Museum of Natural History. The Raven also appears whenever kids are knocked out in "Mob Rules". Modified on January 27, 2017, at 15:54.